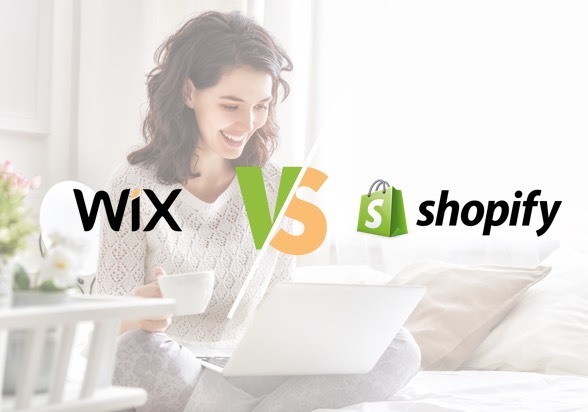 Wix vs Shopify - Which is The Better Website Builder? If you’re building a website and you don’t have any experience with coding or web design, don’t worry – there are many website builders that will walk you through the process and have you running a professional, attractive website in no time. Wix​ has become one of the biggest names in website building, due to its wealth of features and templates, and its simple, intuitive interface. Wix faces strong competition though, from sites like Shopify, which provide top-notch Ecommerce solutions for businesses looking to harness the web to increase their exposure and revenue. In this article, we’ll pit these two industry mainstays hit to head. Both have pros and cons, but we’ll show you why Wix finishes in the lead. Price is a central consideration when looking at website builders, especially if you’re looking for a site to host an online store for a small business or a personal website. Many sites like Wix offer a free option, but typically there’s only so much you can get out of it. For both Wix and Shopify there are a wide range of paid options, ranging from very affordable to expensive options that are only worth it for larger businesses. All packages will link the site to your domain. With Wix, the cheapest paid plan is the “Connect” option, at $4.50/month. Wix brand ads will stay displayed on your website, so you may want to kick in a little extra for the combo plan at $8.50/month. You’ll get 2GB of bandwidth and 3GB of storage, as well as a free domain, a customized favicon and $75 in ad vouchers. Once you get to the unlimited plan, all premium packages include unlimited bandwidth, and increasing levels of storage. Customers looking to set up an online store will have to pay for the Ecommerce or VIP packages, at $16.50 and $24.50 per month, respectively. Both provide 20GB storage, advertising vouchers, a form builder app and a site booster app, though the VIP plan also includes 10 email campaigns/month and a professional site review. On Shopify, the options start at $29/month for the “Basic Shopify” package, and then $79/month for “Shopify” and $299/month for the advanced Shopify package. With the advanced package, users get 5 and 15 staff accounts, as opposed to only 2 with the basic plan. By paying more you’ll also pay less in transaction fees, and with “Shopify” and the advanced package users received gift cards, professional reports, and abandoned cart recovery. Users need to upgrade to the advanced plan though if they want the advanced report builder or third party calculated shipping rates. If a company’s sales volume is big enough it could pay off to upgrade to the advanced plan, in that it has a significantly cheaper transaction fee – 2.4% + 30 cents, as opposed to 2.6% + 30 cents for Shopify and 2.9% + 30 cents for Shopify Basic. Shopify includes three pricing plans, but there isn’t enough difference between the Shopify and Advanced Shopify plans to make it worthwhile unless you have a large enough business. Wix offers more plans with more discernible difference between them. Wix can owe much of its popularity to the simple, drag-and-drop builder that makes website building easy even for beginners. It’s an intuitive interface that doesn’t require users to know any coding in order to construct a site. Wix also provides free and reliable hosting, and will let you customize your domain name. With Wix, users have access to the Wix market and a large selection of hundreds of free and paid apps that they can implement on their site. The app market is a dynamic space that continuously updates and adds new apps. Wix has added new features in 2017, including Wix video, which allows users to embed and promote customized videos on other websites, even if they aren’t built by Wix. In addition, the company has added a Wix chat feature to allow you to live chat with visitors to your website and Wix music, a knockout platform for users looking to upload and their music online. Wix has a brilliant image editor built into the interface, and also provides users with over 500 templates and dozens of unique galleries to showcase your images. In a sense, one of the things that makes Wix so popular is its scalability. You can always add and plug in apps as you see fit, allowing you to grow your site just the way you’d like it. Shopify is an easy-to-use platform that helps users build mobile-friendly Ecommerce stores. Whichever type of Ecommerce store you build, Shopify allows you to either use ready-made templates or alter the HTML and CSS to build the site from the ground up on your own. It is fully customizable and integrates with a wide variety of social media networks. Once you’re online with Shopify, the platform has built in SEO optimization to help your site get noticed. Shopify also comes with SSL security encryption standard, in order to keep your details safe. Shopify has Ecommerce capabilities that are second to none, but its benefits are limited to users who want to launch an online store. For the rest of us, Wix is a better option. Shopify is unrivalled when it comes to Ecommerce features. The site provides an all-encompassing platform to host an online store, and with the Basic Shopify, Shopify, and Advanced Shopify payment plans users receive unlimited products, unlimited bandwidth and online storage, online sales channels, fraud analysis, manual order creation, discount codes, finance reports, and a Shopify made point of sale system. With the Shopify overview dashboard, users can view site analytics including sales, online store visitor data, and orders. Users can allow company employees to access the store and carry out administrative tasks, while still restricting their access to sensitive areas. A less extensive pricing plan is the Shopify Lite plan, which is best suited for people who want to sell products online without a dedicated online store. This is ideal if you want to sell your products through social media sites like Facebook. With Shopify Lite you can also use the point of sale app to sell items in person. And as we mentioned earlier, Shopify provides SEO optimization to help you increase traffic—and sales. There are only 2 Wix pricing plans that include online stores - VIP and Ecommerce. Both plans come with with unlimited bandwidth, 20GB storage, and $75 in ad vouchers, as well as a site booster app and form builder app. No matter which plan you chose, you’ll have access to hundreds of Wix templates, which can match almost any category of online store. With the VIP plan users also receive 10 email campaigns/month and a professional site review. On the plus side, though other Ecommerce sites charge a transaction fee, Wix takes zero commission of sales done through their online stores. Wix also ensures that checkout and processing is secure, and can provide coupons for buyers. With both the VIP and Ecommerce plans, users can set up a Facebook store after purchasing the Facebook store app through the Wix Market. The app is run by a 3rd party company called Shopial and costs $6.99 per month. Both of the plans are for running an Ecommerce site on Wix, so if you want to sync that online store to a Facebook store, you need to purchase the Facebook store app. The app – developed by 3rd party company Shopial – costs $6.99/month. Though Wix users don’t have to pay a commission on online sales, it simply can’t measure up to the array of Ecommerce options offered by Shopify. Wix has one of the easiest, most-intuitive interfaces available. It takes only a matter of minutes for a new user to figure out how to use it, especially the drag-and-drop website builder. There is no need to know coding or the inner workings of web design. When you get started, and you’ve picked a template, it’s very easy to tweak images to your liking and move them around at will. At all times, Wix is easily scalable, through the hundreds of plugins and apps that can be attained through the Wix market. Building a site with Shopify takes a little longer to master than Wix though you still don’t need to be a coding master to get the hang of things. You can also create your own design themes, though you’ll need to understand how to change the coding some. Shopify can help you organize a series of otherwise complicated issues, such as foreign currencies, tax rates, and shipping expenses. Wix has made its name partly by being one of the easiest website builders on the market. Wix has more than 500 templates and keeps adding new ones. The templates cover just about any theme you can think of, and are suited for everything from photography showcase sites to street fashion blogs and a wide variety of online stores. If you don’t find something you’re looking for, you can start with a blank slate and build your site from there. Shopify also features a wide variety of templates, well over 100 at last count. These templates should be able to cover just about type of online store. Wix simply offers far more templates than Shopify. Shopify’s customer service department monitors its sites around the clock in order to ensure an almost flawless uptime. If you do run into any problems, you can access customer service representatives 24/7 by live chat, phone, email, or chat. If it’s not a pressing problem, you can start by accessing the online knowledge base for one of the online tutorials, eBooks, and more. Though Wix is quite easy to use, there’s always a chance you might run into some problems. First off, users can access the extensive Wix knowledge base, which includes a large number of videos and a long FAQ section. Chances are you can find answers there, but if you’re still stuck, you can submit a query ticket or request a callback from Wix. The callback is only available during business hours – Monday through Friday from 6am to 5pm Pacific Standard Time. If you are on a premium plan and you submit a service ticket, it will be fast-tracked so you receive a reply quicker. Though Wix does offer extensive resources online that can answer a large number of queries, without a live chat option it doesn’t match up to Shopify. In a sense, both platforms are winners—Shopify is a top of the industry Ecommerce option, while Wix provides ease of use and templates that are second to none and put them at the top of the website builder industry. Having said that, for users who aren’t looking to build an online store, there’s no reason to go to Shopify. It is a platform designed purely for online stores, and for all other purposes, Wix is simply a better option.